The Engineers PEI Robotics Club is open for children ages 9 - 14 to learn about robotics and work with the Lego EV3 Robot to design and solve real-world problems. If your child wants to learn more about engineering and science fields, program robots, research challenging concepts, work in teams, and participate in tournaments, join the Engineers PEI Future Engineers Robotics club! The students will engage in problem solving, engineering, and robotics concepts at each meeting, as well as practicing coopertition, gracious professionalism, and teamwork. Meets once a month on Tuesday Sept 6, Oct 4, Nov 1, and Dec 6 at the UPEI School of Sustainable Design Engineering Building and will focus on problem solving and learn what the tournament teams are working on. There will be robotics, but the focus will be on engineering and design, as well as supporting their club members to prepare for the tournament. It is free to attend the club and registration is ongoing at the following link: https://goo.gl/forms/mnqeACUiz9SA3nGT2 The first meeting is Tuesday September 6 at UPEI School of Sustainable Design Engineering Building. - Parents are responsible for transporting students to the Truro NSCC campus on November 19th. Attendance is mandatory. Spots are limited for the weekly tournament teams and registration will open on August 5 at the following link: https://goo.gl/forms/mnqeACUiz9SA3nGT2 A maximum of 10 students per team is allowed. Parents will be contacted by August 29 with the placement and night to meet weekly. The first meeting is Tuesday September 6 at UPEI School of Sustainable Design Engineering Building. There will be a parents meeting this night. Our calendar is now available on your phone or at the bottom of the page. See peirobots@gmail.com calendar in Google Calendar Look for ‘Robot Club’ events. 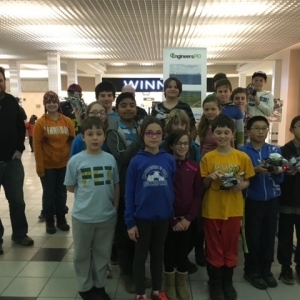 The EngineersPEI Robotics club is a place where kids who have more technical interests can come together and learn about engineering and robotics. It is free to join and has the philosophy of mentorship and doing instead of lectures and lessons. There is a friendly tournament at the end of the year. The robot and program design each team comes up with for the tournament is entirely their own. Coaches and mentors will only help them to learn the concepts and assist with questions. The focus of this is for the students to learn how to design, increase their confidence and abilities, and increase interest in STEM fields. NXT 2.0 and EV3 robots will be used. The tournament team will participate in the First Lego League (FLL) competition in Truro at the end of November. The Robotics Club is always looking for mentors. If you are interested in robots and want to help guide students (or learn about them yourself), please email peirobots@gmail.com. No experience is needed. You will learn with the students! Q - Who can participate? Q – How much will it cost? A – Monthly Club participation is free. The Weekly Tournament Team costs $50 to cover the cost of FLL registration and materials. Engineers PEI has sponsored the cost of the robots and one competition registration, as well as provide t-shirts. Parents are responsible for costs to travel to Truro for the competition. Q – How many students can participate? A – As many students as are interested can join the club. The tournament teams are capped at 10 students. Q - How does my child join the Robotics Club? A - To get on the email list and register your child, go to https://goo.gl/forms/mnqeACUiz9SA3nGT2 . Your child is welcome to join us at the next session. Q – As a parent, how can I be involved? A – You are welcome to be a mentor on the team, but remember that we will have to restrain ourselves: this is the student’s work. We are there only for teaching and guidance. Q – What are the core values with FLL? A- Gracious professionalism, ‘coopertition’, sport for the mind. While competition is fun, the educational aspect of the project is why Engineers PEI is involved. Professionalism and courtesy will be expected from everyone involved: coaches, students, and parents at all times. Q – Where can I go for more information? A – See the FLL website http://www.usfirst.org/roboticsprograms/fll or email peirobots@gmail.com with any questions.